So it wouldn't be beyond imagination to suppose that Cornell alums might try to purchase some of the newly minted merchandise in support of their alma mater. 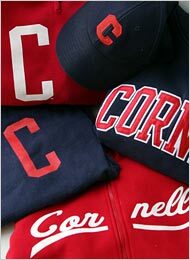 But as far as I can tell, the 'cool' hoodies and hats aren't available through the Cornell Store's incredibly clunky interface, nor are they available through ivysport.com. And I would still like to see some Cornell-brand scarves become available.